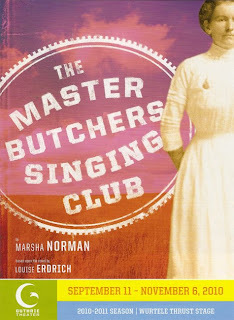 The Master Butchers Singing Club is a stage adaptation of the novel by local author Louise Erdrich. I've read one or two of her books, so when I heard the Guthrie Theater was opening their 2010-2011 season with this play I decided to read the book. I loved it. It's beautifully written and full of rich characters and intersecting storylines, and deals with the epic themes of life, love, and death. It takes place in the fictional town of Argus, North Dakota, where several of Erdrich's novels are set. Fidelis Waldvogel has immigrated from Germany where he was a sniper in WWI, bringing along his wife Eva and their sons. Fidelis and Eva run a butcher shop in town, and one day Delphine wanders in, changing the course of her life forever. The daughter of the town drunk, she has spent several years touring the Midwest with an Ojibwe man named Cyprian in a balancing act. All her life she's been searching for her mother and a sense of home, and comes to find it at the butcher shop. Whenever a book you love is turned into a movie or a play, it's easy to get caught up in the things that were cut out or changed. So I felt a little of that when I watched the play, but I tried to just let it go and let the play be its own entity. And I came to like the slight changes they made, I think it's stronger piece because of it. There's a lot of narration in the play, mostly from a woman whom the townspeople calls "Step and a Half." She walks restlessly through the town, collecting things that people have thrown out and selling them. She narrates the action of the play, as do many of the characters, often describing what they or other characters are doing. It's an effective way to get Erdrich's beautiful prose into the play. The strong cast is full of Guthrie favorites, as well as a few newcomers. Lee Mark Nelson, who plays Fidelis, has been one of my favorites since he charmed me in She Loves Me a few years ago. Not only does he sing in this play, but he sings in German! Recent Ivey award-winner Katie Guentzel plays Eva, and Emily Gunyou Halaas is Delphine. All three fully embody their characters' passion for life and love for one another. That's one of the things that struck me about the book; Delphine and Cyprian truly love each other despite the fact that he's gay so they can never have a true marriage. Fidelis and Eva truly love each other even though he married her as a favor to his friend who died in the war. But the love between Delphine and Eva may be the strongest of all. Eva is friend, mentor, and mother to Delphine, and Delphine helps Eva through some difficult times and takes care of her family. At several points during the play I was wishing I had a tissue! I love that the Guthrie commissioned this play because it's so specific to this region, in the same way the musical Little House on the Prairie was a few years ago. Being a descendant of German immigrants to the Midwest, it's a story that feels very familiar to me, as if I could be watching my own history on stage. I speak a little German, so it was fun to hear some German words thrown in here and there. There are also several Native American characters in the play, and their culture blends with the German culture beautifully through music. It's an interesting coincidence that I've seen two shows this week that deal with the history of Native Americans, although in very different ways. The brilliant new Broadway musical Bloody Bloody Andrew Jackson deals with the "Indian removal" of the early 19th century and the Trail of Tears, while in this show Step and a Half is a survivor of the Wounded Knee Massacre in the late 19th century. It's an important part of our history, especially here in the Midwest, so it's nice to see it being explored in theater.